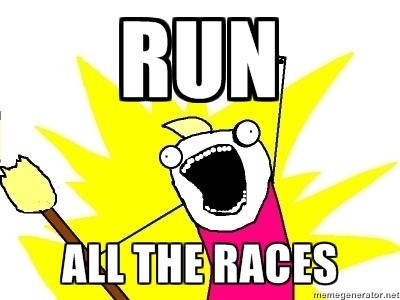 Fall Race Season – Run ALL The Races! | Run Todd Run! I’m training for a full marathon in November and would love to do more half marathons along the way. However the expense would be crazy. Any tricks? Sorry for the late response! As you know, the earlier you sign up, the lower the cost. If you are able to plan ahead far enough, you can save $10-$20 per race. Also, many of them have giveaways in the lead up to the race that can get you free registration, and a lot of them publish discount codes on their twitter feeds or facebook pages that can help. Finally, the smaller, local runs are generally much less expensive than the bigger regional events. Other than that, I don’t know of any great tricks. Thanks for the comment, and good luck!